London has elected its first Muslim and non-White mayor, Sadiq Khan, a son of a Pakistani immigrant bus driver, who will now be the first Muslim mayor in a Western Capital. World’s media was effusive, noting how politics in the UK’s metropolitan hub has over the time transcended race, religion and the skin colour; One report called the new Mayor ‘Citizen Khan’, (After the main protagonist in Orson Welles’ cinematic masterpiece, ‘Citizen Kane’). Some others were less charitable, a news portal, (Predictably enough) in the US flashed: The Muslim Mayor of Londonistan. 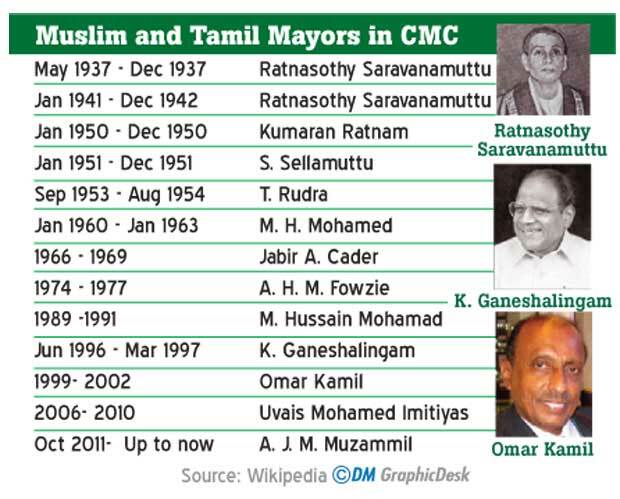 Funny enough, it struck me that we have had Muslim and Tamil mayors in our capital, Colombo for decades, even though no one appeared to have noticed it. succeeded by Karu Jayasuriya, Omar Kamil, Prasanna Gunawardene, Uvais Mohamed Imitiyas and at present Muzammil. Unlike London which since 2000 directly elects the mayor, in our system, the mayor or the PS chairman is nominated by the party which wins the highest number of seats in the local government body. The different electoral methods (London’s was the same as ours until they opted to direct elections) do not make a difference in terms of political representation, though that and the greater powers entrusted with the mayor definitely have an impact in the delivery of policy. So why was our feat in political representation of ethnic minorities not appreciated, even within the country itself? There may be several explanations. First the obvious one: London is fashionable and Colombo is not, therefore it is hip to root for the former and not so for the latter. Second, of course, appreciating the minority representation in Colombo would not help the dominant narrative that ethnic and religious minorities in Sri Lanka are a suppressed lot and that the Sinhala Buddhist majority go to bed everyday thinking how better they would suppress those hapless souls next day. The policy-makers in the EU and North America have been so thoroughly coached on this bunkum by the diaspora lobbies that they are now cocksure that anything contrary to that received wisdom cannot be true. Third, nor did the Sinhala political leadership have genuinely tried to harness many benefits of ethnic and religious pluralism in political representation. Their intentions in political accommodation of minorities have been opportunistic, most of the time. This has led to a new kind of clientelism that smacks of Iraqi politics where the constituent parties of the government distribute the government ministries among themselves and pack them with their loyalists. In Sri Lanka, the ruling party doles out a few government ministries to the minority parties in exchange for their support and new ministers then pack their ministries and public institutions with their goons. And the individuals promoted to government positions and the pubic offices through these means have also proved themselves to be incompetent buffoons and wheeler-dealers. The capable and principled members of minority communities (as well as the majority community) are denied opportunity to contribute to the national policy and development. All of that do not help fostering a culture of genuine ethnic political representation at the Centre. Fourth, the Sinhala political leaders themselves have forestalled and even reversed integration of minority politics with the mainstream. The most devastating among those efforts was made by the first Prime Minister D.S. Senanayake himself. He disenfranchised the Tamils of Indian origin through his infamous Ceylon Citizenship Act of 1948 (and helped by some Tamil political elites including G.G. Ponnambalam) Senanayake’s concerns were petty party political, he feared the growing left-leaning political activism of the estate Tamil communities and their alignment with the mainstream leftist parties (which, along with the Northern parties opposed the Bill). The disenfranchisement of Tamils of Indian origin, among other devastating political consequences and personal sufferings, it unleashed, deprived this country the opportunity to evolve a more ethnically pluralistic political mainstream. When the estate Tamil communities were finally granted citizenship, they flocked around the race- based Ceylon Workers Congress of late S. Thondaman . S.W. R.D. Bandaranaike went further, introducing the Sinhala Only Act, leading to further ethnic polarization. The rest is now history. However, there is another reason, which is perhaps the most compelling of all. Some of the most influential and consequential Sinhala political leaders in independent Sri Lanka might have been closeted bigots and short-sighted opportunists, and some of the early political decisions such as the ones noted earlier were disastrous. However, those were not perfect times, even in the global context. Jim Crow laws were in place in the United States until the mid -1960s. In the Sri Lankan context, in spite of the latent discrimination and no matter how repugnant it was, Tamils still held a disproportionate share in the higher echelons of the bureaucracy and the elite professions: In 1980, one third of the Sri Lankan Administrative Service, legal profession and accountancy were occupied by the Tamils; Jaffna was the second richest city in the country. At the time of the Black July in 1983, the IGP (Rudra Rajasingham) and Attorney General ( Shiva Pasupathy) were Tamil. Justice Suppiah Sharvananda was the Chief Justice during 1984-1988. Thus, the evil of discrimination was not as dark as it was later projected in the Eelam propaganda; definitely not convincing enough to turn Jaffna in to a factory of suicide terrorists. The most consequential of all in the ethnic polarization was the conduct of the Tamil political leadership. Prof Rajan Hoole in a series of monographs highlights how the Northern Tamil political leadership through its maximalist manoeuvring dragged the Tamils, and the country as a whole to the point of no return. The LTTE is the outcome of that political strategy of the Federal Party and later the TULF, aimed at escalation and intimidation of the Colombo government. Tamil political leadership disengaged from the mainstream national politics, partly because they refused to acknowledge the superior numerical aggregate of the Sinhalese majority and preferred to confrontation over accommodation. Mullivaikkal is the unfortunate final outcome. Now, Sri Lanka should genuinely strive to integrate ethnic minority politics with the mainstream national politics. That cannot be done as long as minority leaders choose to dole out plush positions allocated to the party among their kith and kin and henchmen and the mainstream party leaders view such an accommodation more in the context of a narrow political strategy to win minority votes, than a national endeavour to create a more politically and ethnically pluralistic society. We also need more and more competent minority members within the ranks of the UNP and SLFP. After all Sadiq Khan did not run for elections from some British Muslim Party.